Page of "Training Teaching and Talking Karate". Morio Higaonna Sensei was once quoted as saying “If you’re not training then you shouldn’t be teaching”! This is something that I agree with fully. The one thing that I have learned over the years about the leading Karate Sensei and Martial Artists out there, be it the well-known ones like Higaonna Sensei, Shinjo Sensei of Uechi Ryu or even Mikio Yahara of the Shotokan way, or be it others. Their primary focus has been on their own training, not on teaching or talking. Teaching and talking to them is secondary as you certainly don’t get to the level that they have achieved by talking about and teaching Karate. I do feel though that over the past decade or so there has been a big shift in emphasis by many Karate Ka, with teaching or talking taking priority over regular training. 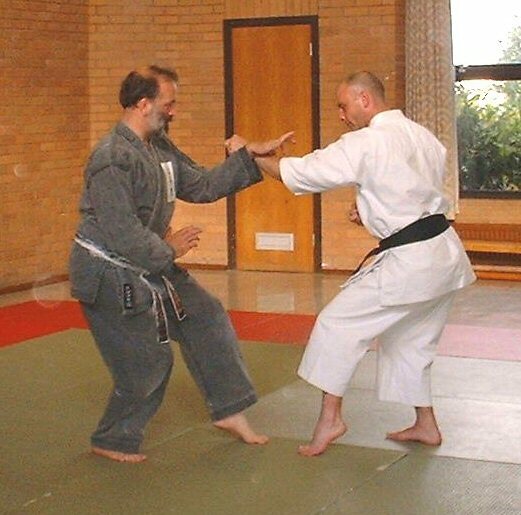 I often get asked what advice I would give to anyone starting out in Karate, together with what is the difference between the Karate of today compared to that of say 30 years ago. The answer is always the same. Seek quality guidance from a Sensei of worth who has a deep understanding, maintain the beginners mind, concentrate solely on your own Karate and always train regular. Do not become concerned with the training that others do, because once you do it will be to the demise of your very own Karate. As for thoughts about teaching or judging the Karate of others, wait at least fifteen years then when such thought arises tell it to go away and revaluate your very own Karate first. Oh and lastly, keep away from so called Sensei who spend more time talking about and teaching Karate or promoting themselves, than they actually do training in Karate. Whilst visiting Okinawa over recent years I have attended many training sessions under the guidance of my teacher as in Senaha Sensei, and alongside myself and other students in the class leading by example there have been the likes of Tamaki 9th Dan, Babladelis 8th Dan and Kinjo 8th Dan, all being Senior Sensei of decades standing in their own right. However, they continue to train hard under their Sensei and lead by example. Yes, they will guide you along the way if you ask them to, but they don’t hide behind their grades or years of training. They quietly continue to go to the Dojo to train hard and focus on their own personal Karate and development as Karate Ka, yes being students foremost, because this is what true Karate is all about, the training…. As for the Karate of 30 years ago or so. Quality guidance and a deeper understanding of the Art was not so easy to obtain in the West back then, Karate was in most cases all a little primitive. So yes, there has most certainly been an increase in attainable knowledge for sure. However, the focus of Karate Ka in that day was always based on regular hard training, not on teaching or talking. There was certainly no platform for the web warrior or teaching soap box that so many Karate Ka easily get drawn in to these days. A Karate Ka of today who is sincere and genuine whilst being dedicated and hardworking, really does have a rare window of opportunity to reach much higher levels of understanding in the Art of Karate than students of only a few decades ago ever did, an opportunity that should be grasped and embraced by those who are serious. I will leave you with the words of my dear old granddad that still ring in my ears and kind of fit well with many I see. “Stop Talking and Start Fighting” and “When the Fight Starts, the Talking Always Stops”.